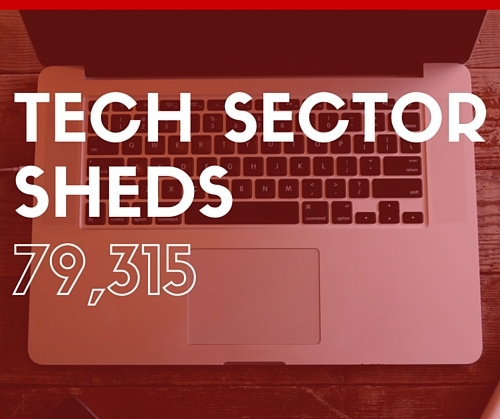 Tech Sector Shed Over 79K in 2015, 13 Percent of All Cuts | Challenger, Gray & Christmas, Inc. Employers in the technology sector, which encompasses computer, electronic and telecommunications firms, announced 79,315 planned job cuts in 2015. That was down 21 percent from a 2014 total of 100,757, which was the highest total since 2009 (174,629). While job cuts in the broader tech sector were down, announced layoffs by computer firms increased by 5.0 percent from 59,528 in 2014 to 62,191 in 2015. The increase was due primarily to a third-quarter surge that saw more than 47,000 announced layoffs from several notable firms, including Hewlett-Packard, Microsoft, Intel and Unisys. Telecommunications experienced the most significant decline in job cuts. Downsizing in the industry plunged 78 percent from a 2014 total of 21,821 to 4,708 in 2015. That is the fewest annual telecom job cuts on record, according to Challenger, which began its tracking in 1993. Overall, the tech sector was responsible for 13 percent of the 598,510 total job cuts announced in 2015. “The technology sector remains an area of solid growth. However, the very nature of technology means there were always be a lot of churn and volatility. Dot.coms come and go as quickly as popular musical artists. Furthermore, the need to remain on the cutting edge means that companies are constantly shifting resources,” said John A. Challenger, chief executive officer of Challenger, Gray & Christmas. “And, just like any other industry, overall strength does not mean that every company will succeed. A prime example is Hewlett-Packard, which announced 30,000 job cuts in the third quarter. A year earlier it cut 16,000 jobs. The company has now shed more than 80,000 workers since 2013 in efforts to become more streamlined and agile. “Yahoo continues to struggle in the search and online ad space. It has already started to sell off parts of its business and may continue to do so in 2016. Sell-offs, along with mergers and acquisitions, could increase throughout the tech sector in 2016. These activities tend to impact workforce levels, if not immediately, at some point down the road,” noted Challenger. Indeed, one of the larger tech-sector cuts in 2015 was the 7,800 Microsoft layoffs that resulted from its shuttering of the Nokia unit, which it had acquired two years earlier in an attempt to boost its presence in the mobile hardware arena. “These types of failures are perhaps more common in the tech sector, where rapidly changing trends force companies to constantly pivot and try new strategies. They will divest in one area and invest in another. Even the large, multinational conglomerates are relatively quick to change directions when necessary. “We could see more of this in 2016, which could lead to increased turnover in the industry. Jobs may shift from company to another, while others are lost. Overall, employment in the industry should continue to grow. So much so, that the biggest problem will be finding skilled workers,” said Challenger.